The Amarillo Helium Plant is a nationally-significant historic industrial site in the Texas Panhandle that awaits rehabilitation. Global helium production was centered near Amarillo with the production of almost all of the world’s supply for over a decade prior to World War II occurring at this plant. (For a history of helium production in Texas, see the related entry in The Handbook of Texas Online and this article by the Texas Historical Commission). This plant, operated by the United States Bureau of Mines, was the first to produce helium from the extensive helium resources in the Texas Panhandle. From 1929 until 1943, it furnished almost all of the world’s supply of helium. Operating around the clock, the plant extracts helium by liquefying the natural gas and separating helium from it at temperatures 300 degrees below zero. The natural reserves in these fields and in extensions into adjacent states contain more than 95 percent of the world’s known supply of helium. This is also the site of the world renowned research center which provides fundamental data on the production and uses of helium. Helium is used for a variety of purposes: lighter-than-air craft, low-temperature research, shielded-arc welding; and in national defense, nuclear energy programs and space exploration. Helium production in Amarillo has been further documented with several drawings as part of the Historic American Engineering Record held by the Library of Congress. In 1996, Congress directed the U.S. Department of the Interior to dispose of the Federal Helium Reserve, and closure of the Amarillo plant began in 1998. The site was declared surplus property in 2006 the General Services Administration. It was auctioned in 2007 and remains privately owned and awaits rehabilitation. 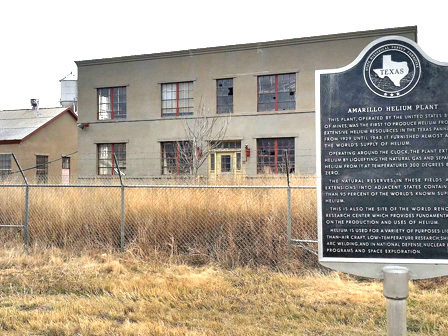 As a result of federally-mandated consultation with the State Historic Preservation Office through Section 106 of the National Historic Preservation Act, the Amarillo Helium Plant is protected by a covenant held by the Texas Historical Commission. However, stabilization and physical protection of the site’s historic structures is urgent. The use of state and federal tax credits can incentivize private redevelopment efforts modeled on successful redevelopment projects undertaken at large-scale industrial sites elsewhere in Texas. Construction of an extension of a major Amarillo-area highway adjacent to the site in a growing section of the city will increase the visibility of this nationally-important site in the Texas Panhandle.